November 24, 2011 - The union representing engineers at The Boeing Company is calling on the company to honor its commitment to use the Wichita site for the U.S. Air Force KC-767 tanker program in the wake of the recent announcement that the future of the site is under evaluation including the option of closing the facility. Representing 550 engineers at the site, the Society of Professional Engineering Employees in Aerospace (SPEEA), IFPTE Local 2001, worked diligently to help secure tanker work for the site during competition for the $35 billion contract. Wichita Boeing was slated to do the final modifications on the KC-767 after the planes were assembled in Everett, Washington. ?Boeing consistently said it would bring jobs to Wichita if it won the contract,? said Ray Goforth, SPEEA executive director. ?At this time of congressional scrutiny of defense budgets, it would be a mistake to materially alter the tanker program they sold to the customer.? Kansas Governor Sam Brownback told reporters at the Statehouse he and the state?s congressional delegation "will fight and fight hard" to keep Boeing in Wichita. He further stated he would remind Boeing officials of the promises they made while he and others fought to secure the massive KC-767 aerial refueling tanker contract, "We?re going to hold the Boeing Company to these words." Union leaders are meeting with Boeing on Thursday, December 1, to discuss the company?s site evaluation. The union is compiling members? concerns and will bring those to the meeting. In September, Wichita engineers agreed to a two-year contract extension with Boeing. Originally set to expire December 2, 2011, the contract locks in terms through December 2, 2013. In addition to refueling tankers, recent work at the Wichita plant includes B-52 modifications, maintaining Air Force One, and the 737 Wedgetail program. ?The engineers in Wichita are the world experts at building refueling tankers,? Goforth said. ?They can get the job done and provide the best value to the Air Force and the tax payer.? KC-X is the United States Air Force (USAF) program to procure its next-generation aerial refueling tanker aircraft to replace some of the older Boeing KC-135 Stratotankers. The contest was for a production contract for 179 new tankers with estimated value of US$35 billion. The two contenders to replace the KC-135 aircraft were Boeing and EADS, following the elimination of US Aerospace, Inc. The current KC-X program follows earlier attempts by the USAF to procure a new tanker. A 2002 plan had the USAF leasing Boeing KC-767 tankers, followed by a 2003 modification where the USAF would buy most of the KC-767 aircraft and lease several more of them. Corruption investigations revealed wrongdoing in the award of the contract and the contract was canceled in 2005, setting the stage for the KC-X program. The USAF issued the KC-X request for proposal in January 2007, then selected the Northrop Grumman/EADS team and their Airbus A330-based tankers in February 2008. In June 2008, the U.S. Government Accountability Office sustained a protest by Boeing on the award of the contract. In July 2008, the U.S. Defense Department reopened the bidding process, but canceled the KC-X solicitation in September 2008. In September 2009, the USAF began the first steps toward accepting new bids. In March 2010, Northrop Grumman announced that it would pull out of the bidding process. Despite Northrop Grumman's withdrawal, EADS decided to remain in the ongoing competition alone. 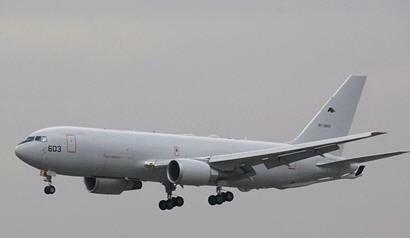 The Air Force selected Boeing's KC-46 bid on February 24, 2011 and EADS declined to protest the award.